The author is the director of nutrition research and innovation with Rock River Lab Inc., and adjunct assistant professor, University of Wisconsin-Madison’s Dairy Science Department. The 2018 corn silage crop is largely in storage. As of the time this article was written, the USDA crop reports had nearly 70 percent of the corn crop rated as good or excellent, which was slightly above last year. Even so, new fungal and bacterial corn plant pathogens and/or historically wet and tumultuous weather conditions throughout forage growing regions made headlines from Iowa to Pennsylvania. On the other end of the growing conditions spectrum, drought conditions dominated portions of Missouri and Kansas. The nutritive (and antinutritive) quality to the corn silage crop is unfolding as growers test feeds. Reflecting back now, the growing and harvest season highlighted the need to be more proactive, monitor crop conditions and fields, and continue learning from one another and our experiences. Lessons learned from this season will prove meaningful for crop improvement in 2019 and beyond. We now have several years of data to review and speak from within our Rock River Laboratory’s database. 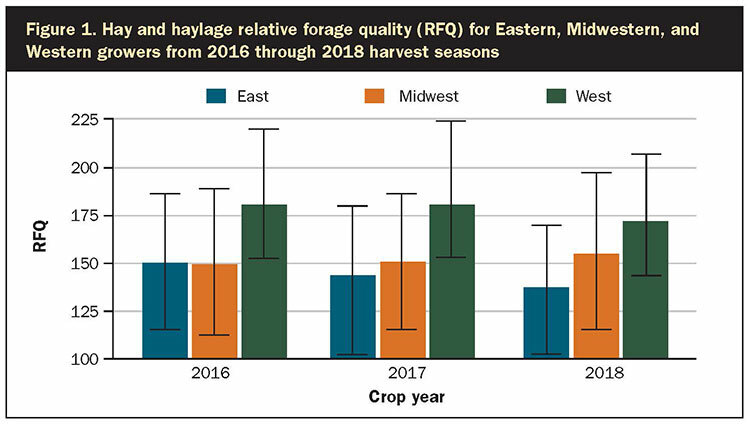 From our 2018 hay and haylage samples, the eastern and western U.S. had slight downward trends for relative forage quality (RFQ, Figure 1). Conversely, Midwestern growers recognized gains in RFQ over prior years. These observations are likely a result of the environment and growing season experienced in the respective regions. The more pointed and economically relevant focus of this article is corn silage. 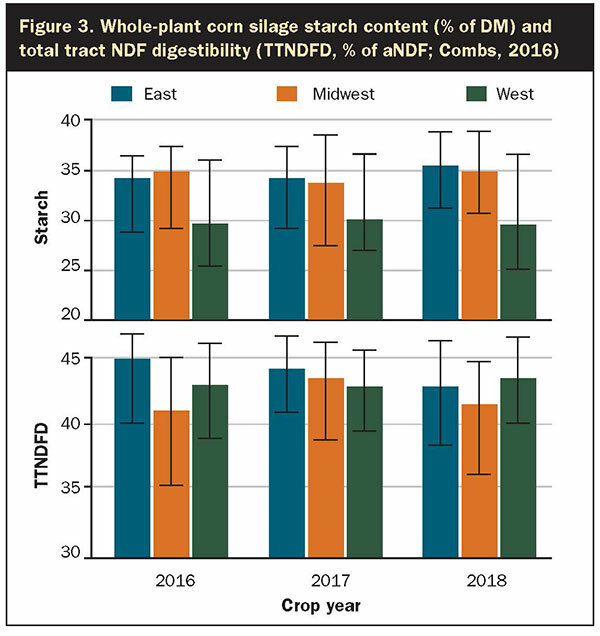 Though corn silage dry matter was relatively consistent in the West, the story is quite different and complicated for the Midwest and Northeast. 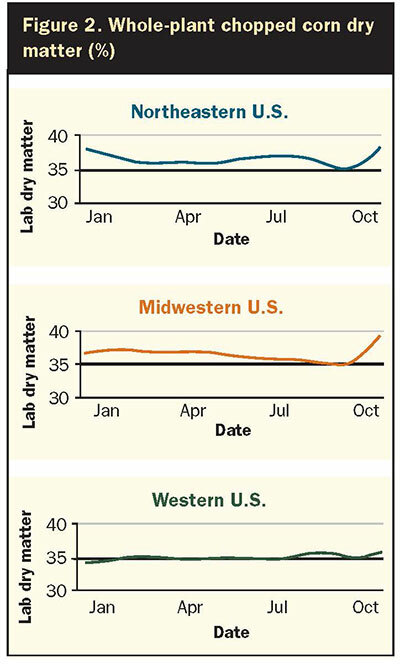 A late-season spike in dry matter occurred beginning in September (see Figure 2). In addition to a delayed harvest resulting in drier silage, fungal infestations may have enhanced crop dry down in many areas. Greater dry matter will contribute to silage stability concerns as this feed is more difficult to pack and ferment. Potentially making matters worse, there appears to be a considerable antinutritional component to many 2018 silages. Vomitoxin levels are trending up again, as was the case with the 2016 corn and corn silage crops; however, the extent of the contamination is unknown at this time. We are also recognizing an upward trend in yeast counts during a time of the year when yeast levels should be trending down with cooler temperatures having a refrigerator effect. In regions east of the Mississippi River, many experienced challenging harvest conditions and may also recognize challenges in nutritive quality. Bear in mind that nutritive value (value per pound or ton) is a combination of both nutrient content such as fiber to starch ratio and nutrient digestibility. Fiber is always about half the digestibility of starch (45 versus 90 percent total-tract nutrient digestibility for fiber and starch, respectively). Thus, the less fiber in feed, the more energy per pound. Quality is further influenced by both fiber and starch fraction digestibility. We’ll assess fiber digestibility here using the total tract neutral detergent fiber (NDF) digestibility measure (percent of aNDF; TTNDFD). Compared to last year, starch content is trending up while fiber digestibility is trending down strongly as the 2018 crop begins to be analyzed at Rock River Laboratory (Figure 3). There are likely several factors at play here. The crop had adequate heat and moisture through the time period when plant lignification is determined. It was also maturing ahead of “normal” due to better than average growing conditions earlier in the year, and then harvest was delayed in many forage-growing areas. Mother Nature is strongly at play here. This is the reason why proactive crop monitoring about 45 days postsilking is imperative (check dry matter and kernel maturity). In summary, do not stress or panic given the points discussed here. Rather, consult with your nutritionist, crop adviser, and veterinarian, and heighten your collective awareness as we get into feeding this crop. There are areas of great silage out there, yet the average appears to be less than spectacular. Consider phasing 2018 silage into diets and avoid quick transitions so as to have opportunity to take a proactive mitigation strategy, if needed. Check the silage silos (silo, bag, pile, bunker, or pits) more frequently and monitor silage temperature upon feedout for yeast growth. Infrared camera assessment can also help find “hidden” heating. Look for further discussion on the 2018 corn crop quality in the months to come. This article appeared in the November 2018 issue of Grower on pages 10 and 11.